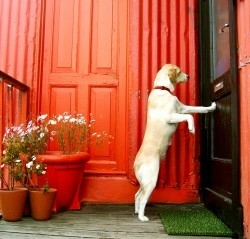 It’s time for an update with regards to our progress with the barking at the front door! I can tell you guys are just shaking with anticipation. The idea for this next stage of training is to add in a stay while you go to, and open the front door. It’s no good at all teaching them to lie down if they’re just going to get up and storm the door once it’s opened. This is where a lot of self-control comes in. In order to teach this, I was armed, yet again, with my trusty treat pouch and the phone so that I can replay the ring. At this point they’re both going to their “spot” and lying down when the bell rings. I’ve repeated it enough that I don’t USUALLY have to cue them to lie down-the bell does that for me. Once they go to their spot, I place a treat between the paws while they lie down. As long as they continue to lie down I keep placing treats on the ground in front of them. At the beginning, I’m literally blasting them with treats (well maybe not quite literally), and slowly, I begin to increase the time between the delivery of each treat. With every couple of days I’m treating less and less. Now add in the door stuff. I give them a treat and take a step toward the door, then come back and give a treat. Then I take another step toward the door and this time I touch the handle, and return to them with a treat. You get the idea? I slowly progress through the process of opening the door, returning to them to reward each time I make it a bit harder. Then at the end I give them a release cue which, in my case, is “all done”. To be completely honest, my dogs probably weren’t quite ready for the door to be opened (you can tell because they keep getting up). I pushed their progress for the sake of the blog, but in real life, I would’ve spent a few more days working on the duration (length) of their stay before I added in movement toward the door. I did it for the fans, what can I say? What I also discovered really quickly is that the size and placement of the treats can make or break the success of the stay. First of all, in the video, you can see the dogs keep getting up to search for treats. The reason for this is that the treats were becoming pretty crumbly because I was getting to the bottom of the bag. Not a good idea. Make sure your treats are a) easy to find and b) easy to eat in one bite. If you’re not careful about this, then your dog will become more fixated on finding treats than on working on the stay-like mine did. I like Rollover the best. It’s probably not the healthiest thing out there, but it truly is “doggy crack” and it’s affordable. I just cut it into pea-sized pieces and store it in the fridge. Let’s talk about the placement of the treats. That means WHERE I’m actually delivering the treats as a reward. Typically, people like to put the treat right in their dog’s mouth. In this case that’s going to work against you. Particularly in a down-stay you want to drop the treat between the paws on the floor. This will keep your dog oriented to the floor rather than reaching up to get the treat from your hand and breaking the stay.